Despite the radio silence the past few days, we've been busy finishing off little projects around this old pile. Most notable is finishing the slate apron for our drainboard sink. We bought the sink before we even closed on the house, and luckily we were able to store it inside the house until we closed. It turned out we did well, as we've found evidence that a similar sink may have been installed under the small window next the the chimney (along with a beadboard backsplash). By evidence I'm referring to the stray mounting brackets found on the third floor, the plumbing holes in that section of floor, and outlines on that wall after I stripped the paint and wallpaper. We chose not to install the sink in this corner because it would have meant that there could be no cabinets on this, or the adjoining wall (not to mention a dishwasher), and the small window is too high to look out of. Although these big porcelain drainboard sinks are common around here, this one was unique with its clipped corners and beaded detail. It also has the coveted large drain hole, meaning that at some point we can hook up a garbage disposal. What it didn't have was its wall brackets, and finding ones the right size proved impossible. It ended up not mattering since we were placing it in front of the window, but it forced us to come up with a way of installing it. I've seen these mounted on top of custom cabinets, but cost-wise that wasn't an option for us. Instead we built a deck - bolting a ledger board to the wall and building off of that using 2x6s and joist hangers (this thing is heavier than you can imagine). If any of you have driven through rural areas where you can identify the old homesteads by the chimneys that are still standing in the woods you can get an idea of how strong this sink is, come the apocalypse it'll just be our 5 chimneys and the sink still standing . . . The framework is hidden on the sides by the only two cabinets we kept from the kitchen that was here when we bought the house. They're cheap 70's particle board, but they were in decent condition and saved us from buying new (if we bought new we'd have had to buy custom cabinets that matched either the built-in or salvaged cabinets we're using). We've set it up so we can remove and replace them if we change our minds at some point. 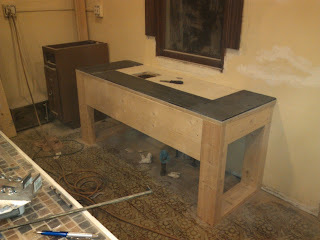 The top is plywood covered with hardibacker and salvaged blackboard slate. We were concerned about cracking the slate when we put the sink on top, but it all went smoothly. The piece de resistance is the three pieces of slate across the front which are parts of two different slate mantles. We've had these materials ready to go for months now and were dreading the process, but zip boom bang and 15 minutes later we were done. The sides are attached with heavy duty construction adhesive (you can see they're off the ground for height reasons, we haven't decided what we're filling in the gap with) and were clamped for 48 hours. The middle already had 8, half inch diameter holes, so we used bolts to attach it to the frame. I would have liked to put bolts in the side pieces as well, but despite having drilling through slate before, I just didn't have the guts to potentially ruin a piece for cosmetic reasons. If the construction adhesive fails I'll reconsider. We still need to grout the seams and clean and seal the slate, as well as caulk the gaps. We will eventually sew a curtain to hide the plumbing, but for now I'll just enjoy not having to move or trip over the slate ever again! What a cool sink! Just think, you'll have it forever! Good job!